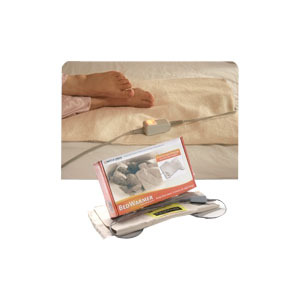 A Battle Creek® BedWarmer™ is the perfect solution for poor circulation or cold feet. People with Arthritis, PAD, Chronic Fatigue, Fibromyalgia, Reynaud’s, MS, RLS and many other problems can benefit from the soothing warmth. The 18" x 36" size can warm just one side or all across the bottom of the bed. The standard, single temperature model warms with a low, consistent heat to surround feet and legs without heating the whole bed or raising the thermostat, and features a lighted on/off switch. The deluxe, dual-temperature model allows the user to heat the unit quickly to warm cold feet, and then switch to low heat, to maintain warmth through the night. This model features a luxurious fleece cover that adds an extra layer of comfort - especially if you prefer the BedWarmer™ on top of the sheet. Single temperature model heats the bed at a steady rate through the night. Simple On/Off switch with lighted toggle makes it easy to see when unit is on or off. Perfect fit for one side of the bed, when one of you wants more heat than the other. Lay across the bottom of the bed to share, for warm feet and legs. Low, consistent heat rises up so it warms the entire area - not just the top of your legs. No need to heat up the whole bed or raise the thermostat setting just to keep your feet warm. Out of the way placement under the sheet and mattress pad. 10 ft. cord makes it easy to reach a wall socket.